Grasses have become very popular with gardeners and landscapers, and for good reason. They're gorgeous! And they are some of the most interesting plants in the garden all winter. The Miscanthus varieties have the beautiful plumes, and are the most popular group of grasses. They plume out from August to October, depending on the variety, and stand anywhere from 2 to 8 feet tall. The Panicum varieties plume out in August. They make great fillers for bouquets, mixed with flowers or other grasses. Most stand around 4 feet tall. Panicum ‘Northwind’ was named the 2014 Perennial of the Year by the Perennial Plant Association. The Calamagrostis varieties plume out in July, and stand stiffly erect at about 4 feet. Calamagrostis ‘Karl Foerster' was the first grass named as Perennial of the Year in 2001 by the Perennial Plant Association. 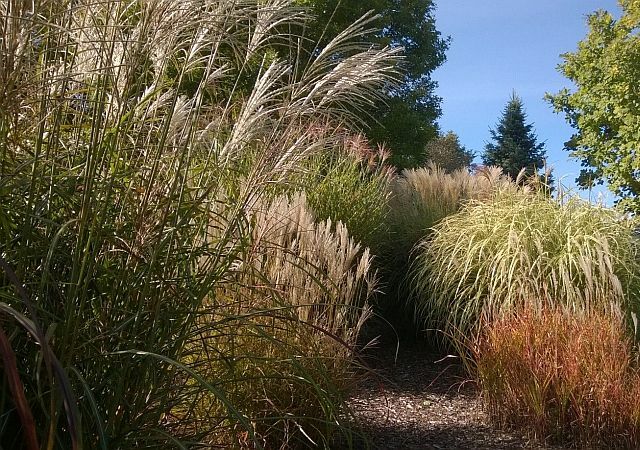 Most grasses want to be in full sun, but there are some good grasses for shadier areas, such as Hakonechloa and Carex, which are shorter than the sun grasses, but still lush and interesting.